Phosphorylation of conserved tyrosine residues in the cytoplasmic domain of ephrinB ligands is thought to be a critical event in triggering reverse signaling. 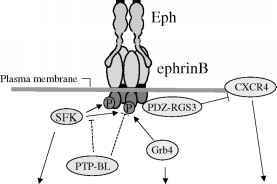 EphrinB phosphorylation is induced either by stimulation with the soluble ectodomain of Eph receptors or by contact with neighboring cells expressing Eph receptors. 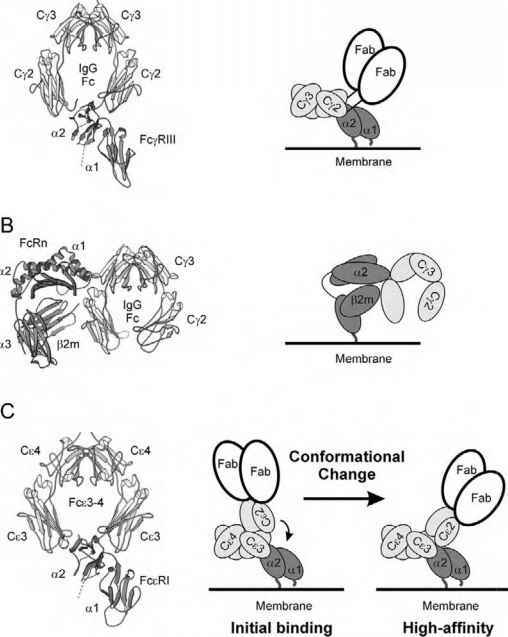 Alternatively, ephrinB phosphorylation can be induced by treatment of cells with fibroblast growth factor (FGF) or platelet-derived growth factor (PDGF) via the co-expressed FGF or PDGF receptors. Src family kinases are regulators of ephrinB phosphorylation induced by the EphB ectodomain. SFKs are rapidly recruited into ephrinB-positive membrane patches, and their kinase activity is activated by treatment of cells with the soluble EphB ectodomain (Fig. 2). Most importantly, SFK activity is required for EphB-induced sprouting of endothe-lial cells that express ephrinB ligands. Figure 2 Structure of ephrinB ligand and associated signaling molecules. Upon binding of their cognate Eph receptor on neighboring cells, ephrinB ligands are clustered and Src family kinases (SFKs) are rapidly recruited to ephrinB clusters. SFKs phosphorylate the ephrinB cytoplasmic tail, which leads to angiogenic sprouting through an unknown mechanism. Phospho-ephrinB recruits the Grb4 adaptor, which mediates changes in cytoskeletal organization. The tyrosine-specific phosphatase PTP-BL negatively regulates Src kinase activity and dephosphorylates ephrinB with delayed kinetics (dashed line). PDZ-RGS3, through binding to ephrinB, suppresses CXCR4-induced cell migration (see text for details). Grb4, a relative of Nck (which is implicated in Eph forward signaling). The Grb4 SH2 domain, but not the Nck SH2 domain, binds to phosphorylated ephrinB after engagement with EphB receptors. Grb4 binds, through its SH3 domains, to several polyproline-containing proteins (Abi-1, CAP, axin, and others), all of which are modifiers of the actin cytoskeleton. Consequently, recruitment of Grb4 to ephrinB causes loss of polymerized F-actin structures and disassembly of focal adhesions .